This month’s Old Navy post is featuring shorts & tees – but instead of pairing these basics together, I decided to show you different ways to wear each of these patterned pieces separately. Their printed shorts in this 5″ cut are the perfect length and so easily can be dressed up or down. Admittedly, I already own an impressive selection of striped tops, but these t-shirts are so affordable, ideal for layering & with just the right amount of stretch…I couldn’t resist stocking up on a few more. I’d love to hear in the comments below which look is your favorite and how you like to change up versatile pieces like these for summer! Love the second and fourth outfit the best but of course I love all of these looks! Old Navy has the best basic tee's, especially the striped ones! I just love your style so much! All those outfits are perfect! All the looks are great as always! I really like the ikat print shorts dressed up. I have a similar pair of shorts and will be recreating this outfit. Beautiful photos and outfits! Love the printed shorts! THIS is a TOUGH one! I like them all…but I guess if I had to pick one, I'd go with the shorts and blazer happy hour look! Those shorts are FAB! i like the Happy Hour-outfit the best 😀 but the others are great too. Love all 4 looks. Especially the 4th ~ perfect for summer ~ love the way you tied the eyelet top! love all of them but the first look is my fave! That ASOS clutch has had me dreaming the last few weeks – I just need to bite the bullet and buy it already! You look fab! love that pink maxi on you! Wow. So many great looks! You're making me want to load up on printed shorts! Such cute looks! I love the happy hour look. That clutch is fantastic! Love all of these in a major way. Totally chic. 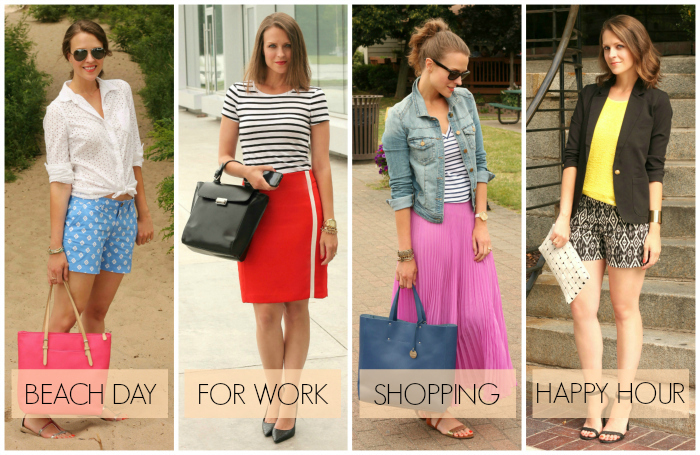 The maxi skirt, that eyelet (which sadly never fit me well, boo), the perfect stripes, swoon! 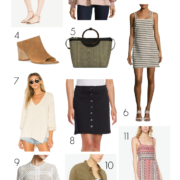 SO many cute outfit options! Definitely love that eyelet shirt! Love all your looks!! That pink skirt is just too cute!! Love all the looks, especially the first two! These outfits seem so effortless and perfect—great for summertime! Of course you nailed all of the looks…it's no surprise! 🙂 My fave is the maxi skirt and denim jacket. That is the perfect striped shirt! All of these outfits are so cute but I love those printed shorts!! Love all the looks but I love the Happy Hour outfit most of all! I'm loving that striped tee! You look so amazing in color! I must say, the red skirt look is my favorite! The beach is close! SO cute how you styled these!!! Great looks, I love the striped tee with a pleated skirt! Really loving old navy pieces, so perfect for summer! I love the "shopping" look. The maxi skirt could go fancy very easily but the striped tee and jacket dress it down. Love every single look, but my two favorite ones are: Work Look, and HH look. They are more of my style, and I can see myself wearing something like that. All four looks are stunning! You sure know how to rock prints and colors, lovely pieces from ON! All the looks are fabulous, but I really love the pink maxi with stripes and denim…perfect! Super cute!! Love the maxi skirt! I love all the outfits, but my favorite one is the last one. The top is very unique and the blue shorts are fun.Love it! I'm solving you now. Love your blog. Would you like to follow my blog? love the beach look. always a fan of white tops! Really like the Printed shorts and jacket. adore those blue shorts and eyelet shirt!